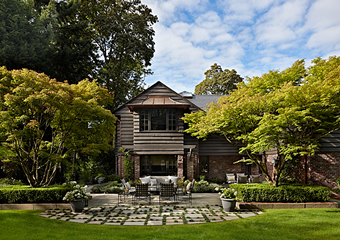 In 2008, Seattle Landscape Architect Brooks Kolb was approached by clients who had purchased a lovely tract of wooded property high above a ravine off of West Mercer Way. 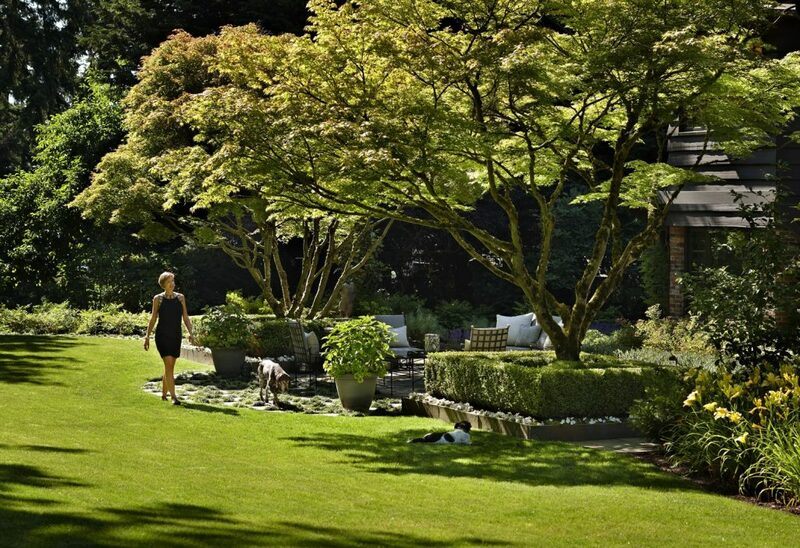 Intrigued and pleased with their conscious choice to obtain a woodland garden rather than a wide-open swath of waterfront, Brooks set about to enhance the landscape in tandem with an extensive architectural renovation of the low-slung 1940’s house. Recognizing the beauty of the dark clinker brick and split cedar facades, the owners chose to use clinker brick both in the new architecture and for a series of low, landscape retaining walls. While the theme of the interior design was lavish Hollywood Glamour, Brooks designed the landscape to provide restful, quiet elegance. Entering the site through an ornamental metal vehicular gate with a geometric design of triangular chevrons, one proceeds onto a new driveway and autocourt paved with small porphyry cubes from Argentina. The driveway widens into a semi-circle to embrace a new, curving front entry walk composed of bluestone panels alternating with bands of ground cover and flanked by formal garden beds. To the left of the front entry path and borders, a great lawn extends out to the western edge of the garden, surrounded by flowering Viburnums and Cherries. To the right, a tennis court surrounded by a grove of Timber Bamboo has been re-furbished. New steps at the back of the tennis court, along the net line, lead up to a high perch for viewing both the tennis games and the garden itself. 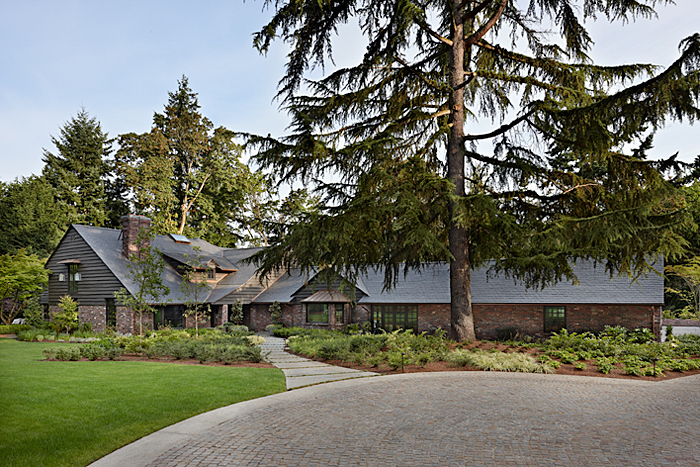 Lined with Japanese Ironwood trees, the driveway leads to an autocourt and garage at the top of the ravine. 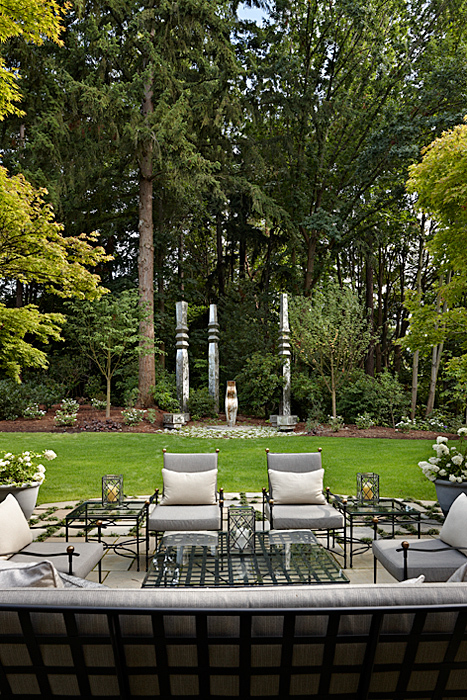 At the far end of the lawn, a stainless steel sculpture by famed Portland artist Lee Kelly is centered on the line of site from a bluestone-paved terrace across the lawn. 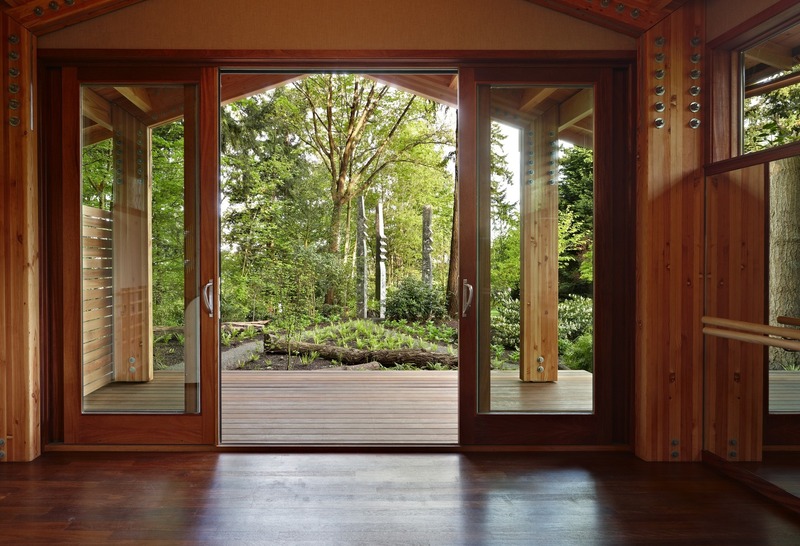 Behind the sculpture, a rustic woodland path leads to a Yoga Studio, built as a retreat in a clearing in the woods. 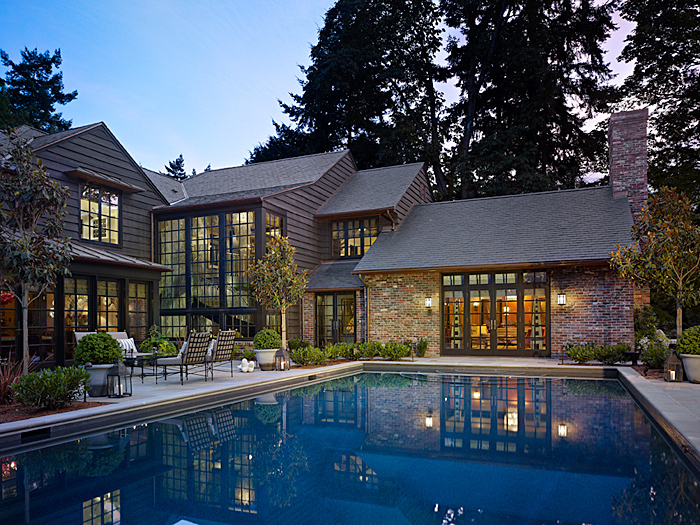 Behind the house, two wings extend to enfold a swimming pool courtyard overlooking the ravine. 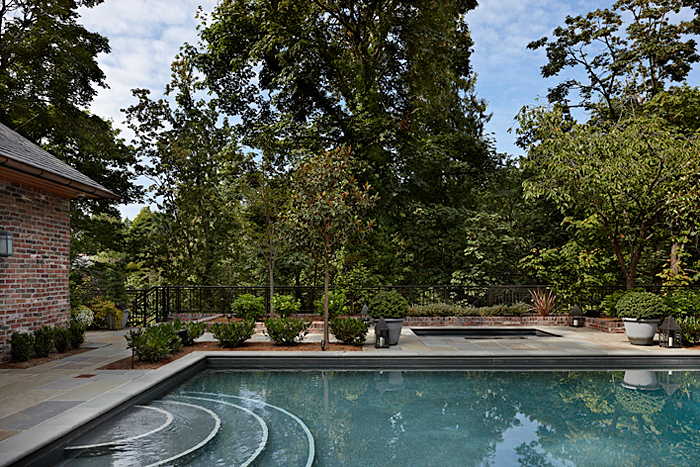 Here, Brooks designed new bluestone patios for outdoor entertaining surrounding the re-furbished swimming pool and spa, which were finished with Black Pearl pool plaster to reflect the house and garden. 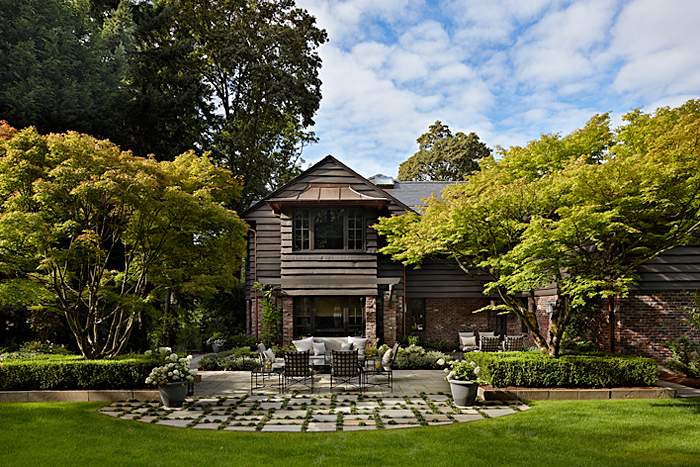 The landscape design for this project appeared in the June 9, 2013 issue of the Seattle Times’ “Pacific NW” Magazine, with a story by Valerie Easton and photos by Ben Benschneider.